SpaceX's Falcon Takes Flight: Can the Private Sector Do Space Better? NASA has never been an exclamation-point outfit. The folks who work there may do extraordinary things, but they tend to talk about them in the dry and uninflected tones of the engineers they are. So it was something of a departure last week when, after an unmanned version of what may well be the next spacecraft that will carry American astronauts into orbit took off from Cape Canaveral and returned home safely, the first official dispatch read simply: "SPLASHDOWN!!!" Unfamiliar too was how the announcement was made: it was a tweet. That tonal change was by no means the most important thing that made the launch of the fancifully named Falcon 9 booster and Dragon space capsule different from all the granddaddy Saturns and Titans that have gone before it. Far more significant was that this ship was privately designed and privately built, the brainchild of the California-based rocketry start-up SpaceX, owned and operated by engineer Elon Musk, who also created PayPal. "It's actually almost too good," the never reticent Musk said of his accomplishment at his postflight press conference. "There's a natural reaction that sort of blows my mind, and it's hard to be articulate with a blown mind." If old NASA hands winced at this kind of giddy talk, they kept it to themselves  and wisely so. In the face of contracting federal budgets and an expanding private sector, the space agency of the golden years is being blown up and rethought  transformed from a government operation into a public-private partnership that, so its advocates say, will replace the politics, stodginess and glacial pace of Washington with the speed, nimbleness and accountability of the marketplace. That door had been creaking open for a while, but the Obama Administration  facing towering debts and a nation in no mood to spend big on an indulgence like space  has kicked it wide, and Musk is not the only one rushing through. The Orbital Sciences Corporation of Dulles, Va., is vying with SpaceX for government recognition and government contracts. So too are traditional aerospace giants like Lockheed and Boeing, whose rockets are not currently intended to carry astronauts but, they insist, could be redesigned to be safe for humans in short order and at a reasonable price. Such competitive churn is exactly what the private sector likes to see. But detractors worry that it's exactly the wrong way to take people into orbit, much less to the moon and beyond. Manned spaceflight is a uniquely risky, uniquely pricey, uniquely time-consuming enterprise that does not respond well to the pressures of the business cycle. Go too fast and people die (think the Apollo 1 fire), but go too slow and investors gripe. Best to take your time, keep the investors out of the loop and avoid the periodic tableaus of the flag-draped coffins and grieving families. "Every time we f___ up," says Mike Griffin, NASA administrator from 2005 to 2009, "it's because something that we didn't think mattered turns out to matter. Who knew that a briefcase-size piece of foam could bring down an orbiter? The stuff that kills us isn't going to be the thing we think will hurt us." But even old-school rocketeers  including Griffin himself  recognize the current reality, which is that without the private sector, America may simply not have the wallet to put human beings into space for a very long time. Giving private companies skin in the game may be an inevitable step if we don't want to become an earthbound nation, but what worries detractors is whether it's a prudent one. The privatization of at least some of the manned space program has been inevitable for a while  particularly since 2003, when the loss of the shuttle Columbia made it clear that the entire aging shuttle fleet was becoming too risky to fly. NASA had made only the sketchiest plans for a shuttle replacement, so in 2006, Griffin created an office called Commercial Orbital Transportation Services (COTS) within the agency to draw private companies into the business of helping to deliver cargo and crew to the International Space Station, even as NASA developed its own Earth-orbital rockets too. The Obama Administration turbo-charged things this year when it officially directed NASA to scrap its part of that work and concentrate exclusively on space science and eventual manned flights to asteroids or beyond. The private sector alone will tend to near-Earth orbit. 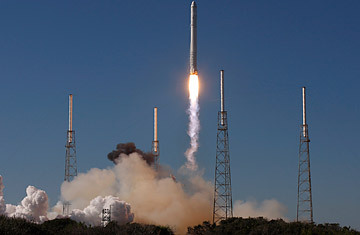 SpaceX and Orbital Sciences had already made enough progress to secure conditional contracts with NASA to service the space station, but SpaceX was clearly the greater of those two equals, with successful orbital missions in 2008 and June 2010. Last week's mission blew those other two away because it included a working prototype and successful return of the Dragon space capsule, making SpaceX the first private company to achieve such a feat. "It's a historical truth that government goes into those areas in which there is no private-sector profit motive, and the private sector follows behind," says Phil McAlister, acting director of NASA's Commercial Space Flight Development team. "We think the time is right to transition that part to the private sector." Such transitions are usually slow, but Musk, a space newbie, sees no reason to wait. His press conference was equal parts Q&A and touchdown dance  and that raised eyebrows. "People sometimes assume that to take a cargo spacecraft and put a crew into it requires this enormous amount of magical pixie dust or something," he said. "This is not the case. If there had been people sitting in the Dragon capsule today, they would have had a very nice ride." Well, no. For one thing, there are no seats. For another thing, the life-support system is not remotely human-rated yet. Those are more than details. Every bit of additional hardware adds weight and complexity and the possibility of a breakdown  and if that breakdown occurs in the network of tubes and tanks and fuel cells that feed air and power and water to the crew, the mortal consequences can be immediate (think Apollo 13). Musk is right that it's not pixie dust that makes a spacecraft suitable for what the space community sometimes calls "payloads with a pulse"; it's rigorous testing and retesting of multiply redundant systems, until you've reduced the risk of failure to a statistical rounding error. When Musk spoke equally glibly about scrapping the Dragon's parachute-based re-entry system and instead using a motor and legs as the lunar landers did  something no manned craft has ever achieved on Earth  he caused more murmuring still. The established space companies are being no less flip in their belief that they can leap quickly into the manned-space pool. There is a lot that goes into human-rating a rocket that was built to launch only satellites, not the least being redesigning it so it can fly on a shallower trajectory that reduces the g-forces to a level a human body can tolerate and retrofitting the booster with both hardware and software to make an abort possible. Astronauts speak of so-called black zones during a powered ascent  points at which speed or angle of flight rule out any safe abort, regardless of what onboard equipment you have. Unmanned ships have plenty of black zones since there's nothing on board that can die if the vehicle blows up. Astronauts want no black zones at all, and recent years have witnessed an unseemly tableau of manufacturers and astronauts sitting at conference tables haggling over just how long a black zone would be considered acceptable. Would you tolerate 10 seconds in which there'd be no saving you if something were to break down? How about a minute? How about two? "What you get is an alternative discussion led by people who stand to make a profit," says Griffin. "Lockheed and Boeing say NASA's goals are too strict. Well, that's fine  up until the first accident, when people say, 'Where were NASA's standards?' "
Among the leading companies, it's Orbital Sciences that, at the moment at least, seems to be threading the needle most carefully  if least showily. With former shuttle astronaut Frank Culbertson heading up its human-spaceflight-activities group, it is concentrating on developing a cargo vehicle for the space station as well as a new launch site at NASA's Wallops Island facility in Virginia, with no talk at present of trying to fly crew. NASA, while ceding some of its turf to the private sector, is both immovable and believable when it says it won't let safety suffer. Any private craft approved to approach anywhere near the space station  much less carry crew  will be subjected to the same rigorous flight-readiness requirements the agency's own spacecraft are. In the meantime, U.S. cargo and astronauts can always get to and from orbit if seats are bought aboard Russian Soyuz ships. The Soyuz already makes regular runs to the space station and will become America's sole means of transport after the last space-shuttle mission is flown next year. The hope both inside and outside NASA is that we won't be thumbing rides for too long  but that we'll suffer that indignity for as long as we have to and vet any new ship fully and well before we commit lives to it. Musk may have been right last week when he was asked about people who resist the inevitable move to privatization. "They'll be fighting on the wrong side of yesterday's war," he said. But as Musk himself knows, wars have casualties. There were 14 of them in the shuttle program and three in Apollo, and that was with some of the best safety protocols imaginable. NASA does things the old way, but until a new way proves itself  which it eventually will  it's still the best way we have.